The new EconoMizer die lubrication system form A - S Mfg., Inc. is designed for micro to mini stamping applications where minimal lubrication is required. "Airless Spray" is a method of emitting fluids out of a spray nozzle WITHOUT mixing with air. Air is utilized to operate a piston to charge and discharge fluid from the stainless steel pump. The fluid is forced, slug by slug, through a spray line until desired lubrication is achieved. About A - S Mfg. Established in 1990, A - S Manufacturing, Inc. has grown into an industry leader in lubricant application technology. Factory-trained distributors can provide the knowledge necessary to make your lubrication project a success. A - S Manufacturing, Inc.’s goal is to keep your lubricant usage to a bare minimum, while efficiently applying enough lubricant to manufacture quality parts. It is important to key on such aspects as spray nozzle location, lubricant volume control, and proper timing. 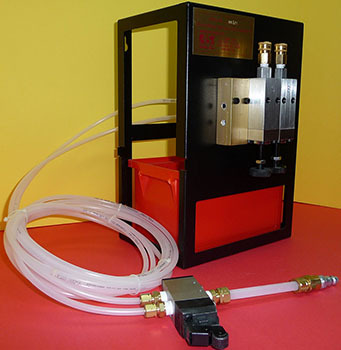 We guarantee that the utmost quality and workmanship will go into building your TeK-Spray/POLARAS lubrication systems. We keep an ample stock of pre-assembled systems in our staging area which makes our delivery times among the quickest in the industry.